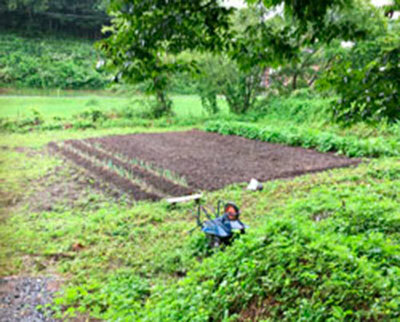 Lavorare Pecore, a type-B support centre for ongoing employment, began its operations on July 29th in the town of Murone, Ichinoseki city, Iwate Prefecture. It is administered by the “Homare no kai” association. Despite the rain, approximately 100 project members and community locals attended the opening ceremony, which was complemented by an elegant harp concert. Lavorare Pecore is a facility surrounded by nature with an extensive area of almost 1 hectare, or 2.45 acres. It was a long and hard road before Lavorare Pecore was able to begin its operations. The four board members of the “Homare no kai” are all from Kesennuma city and survivors of the Great East Japan Earthquake. They had engaged in supporting people with disabilities for many years. While the four of them worked in a consultation office, they realized that there were not enough places who would receive victims whom had suffered from the earthquake or received abuse by their family members. Many of them had nowhere to go because their conditions did not fulfill the criteria of existing facilities. Thus, the members of “Homare no kai” felt those services were limited. It was then that they were approached by an earthquake survivor who ran a landscaping business. As he was going to close down his business, he offered for them to use his land and house in Murone. The four members all agreed immediately to establish a new place for those who were having difficulties finding a facility. 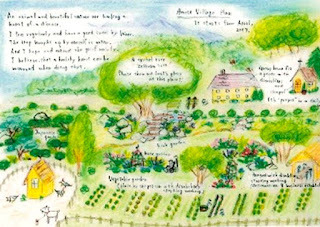 An image illustrated by Mr. SUGAWARA, a representative of the board who is also a certified landscape designer. In this illustration, he expresses his hope that all residents will live happily and in peace for the rest of their lives. However, with little funding, the operation hit a rough patch. Having only the four board members to clear the dense woods in the area, as well as restore the house whose floor had fallen through from a leaky roof, was very challenging and made them feel discouraged on many occasions. But, each time they remembered the faces of those who are not accepted by any facility they were motivated to overcome their struggles, finally opening a group home in November, 2016. They were convinced that there were still more needs to be satisfied and came to the decision to launch this support center. 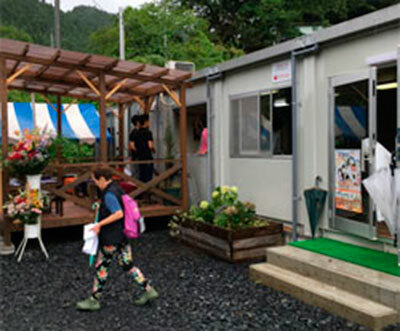 After being referred by Mr. Ryuichi MIURA of Japan Platform, Tohoku office, AAR Japan provided a part of the costs connected to the construction of the building (the photo on the right). AARJ Japan also provided full funding for the plumbing, transportation of the arbor and garden planter, as well as donating the kitchen equipment. All of this was done with the assistance of AEON 1% Club Foundation. For the time being, the plan for the newly opened type B center “Lavorare Pecore” is to prepare dishes with seasonal vegetables and local specialties, herd sheep and cultivate the seedlings of fruits, vegetables and flowers. They also aim to process and sell their wool or fruit products. The members hope that by interacting with animals and plants in nature, the residents and service users will gradually gain emotional stability and improve “their strength to live” in society. Moreover, making good use of their hectare of land (2.45 acres), they are aiming to not only be engaged in farming and produce specialties, but also to expand their business to distribution and sale. A mobile store to extend the outreach of “Lavorare Pecore” products to one-person households, elderly households and people in areas with little access to supermarkets is also being considered. ※This activity is operated with the assistance of Aeon 1% Club Foundation. Ohara joined AAR Japan in August 2011 after working in a manufacturing company. Based in Sendai, he visits affected areas such as Iwate, Miyagi and Fukushima on a daily basis and is engaged in reconstruction assistance. He was born in Sendai, Miyagi Prefecture.